It wasn’t easy to support my son’s decision to travel across the country to play on your team. Now, 5 years later, with 20/20 hindsight, it was a brilliant decision. And not because the team won the National Championship…but because of the five years which led up to this championship. You see, when his skills at volleyball emerged so strongly, a dozen or more university coaches emailed, tweeted and IM’ed my boy. There was lots of interest in him…lots of promises about what a career could look like in their program. But you did a couple of things that mattered that made your program stand out. While others mostly saw his strong arm, and his nimble, lightening-fast reflexes, you saw his heart. You understood that he could encourage others, be a leader—one of his strengths is to help others play better—and that mattered to you. And when you saw his heart , it mattered to me. Mommas love when their boys are loved for who they are even more than what they can do. You also spent time with us—he and I. I got to ask my questions, and express my concerns. You took time to explain to me how you ran the program in a way that would help my son grow into a whole person, not a machine that could do amazing things with a ball. I suspect that you already know that families make their best decisions together. When you included me in the process, that helped me help him make the best decision. You were candid during the recruiting process and you said some things to my son that he didn’t want to hear. He loves to hit the ball hard. No one who likes to spike the ball as much as he does wants to hear that he is too short to be a hitter on a top team. That was really hard for him to hear—but truth be told, that actually increased his respect for you and trust for the program. You didn’t feed him a line he wanted to hear—you clearly spoke truth to him. That was kind. Thank you for that. I did love how the pre-game warmup built in a hit for him before each and every game. You understood his heart and that warm up hit created an opportunity for him to, well, be him. I’ve watched him grow in these last years…and while I know he has always been a natural leader, you saw it in him, and celebrated that in him. That helped him grow. I loved watching your eyes twinkle yesterday when you told me that he was doing the talking during some of the time outs in the National Championship. You knew he was saying the right things at the right time so you stayed silent and let him lead. I’ll always remember that. I suspect he will, too. You expected a lot out of him and his teammates. You set the bar very high. You let them know that great performance arises only out of great effort and investment. He learned perseverance and grit that will serve him well in the rest of life. He also learned that when you ask much of somebody—you only do so when you demonstrate that level of commitment from yourself. You worked as hard as anybody towards this championship. My boy learned what integrity looks like from watching you. No mother could ask for more. I remember talking with you last year about struggle. You valued adversity and were worried when your team didn’t have enough of it, what would happen. This year, the team lost a game mid-season–a result of poor play. You let the fall out from the loss happen without short circuiting the process. You clearly let them know you were disappointed and angry at their performance. Then, you stayed away to let the team members individually and as a whole wrestle to figure it out. You let them talk with each other, and muddle through their attitudes, the mind games they were playing in their heads that were working against them. You stood back to let them labor to come to a better place. It wasn’t easy for them. I know my son was stressed as they had some difficult and important decisions to figure things out. I think they were a better team after that. It’s not easy for most of us to stand back and give the people we lead the space to work out their own learning. But the richness of the hard struggle to get there deeply embeds the learning. A few weeks ago was Senior’s Night at the last home game. 5 young men that have played on the team and are now graduating were honoured that night. It was compelling to hear you speak of each one of them. You told us how every single one of those athletes were indispensable for the team and why. Senior’s Night was a night where a more junior athlete spoke lovingly of the influence of each of the senior athletes. Yes, lovingly. With tears and fondness. Acknowledging the contribution of how that graduating athlete had made a difference in his life. 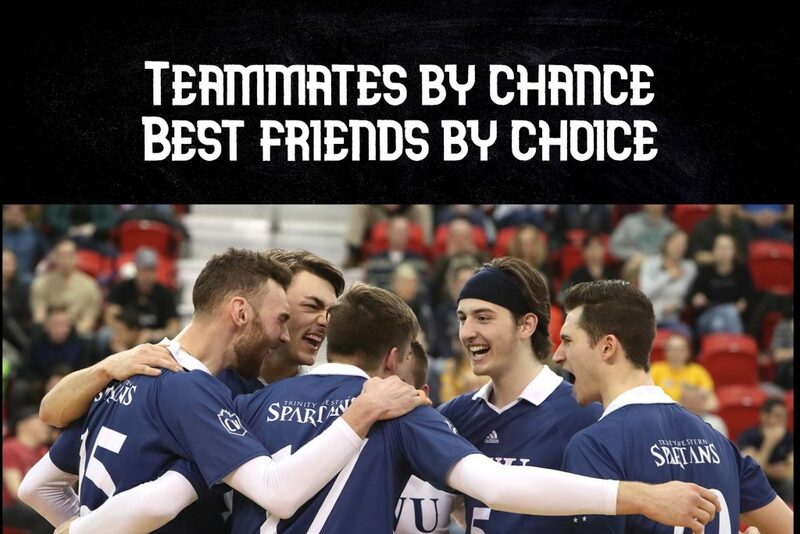 You have created a culture where they are “teammates by chance, and friends by choice”. These young men spoke tenderly and beautifully about the senior athletes in an uninhibited fashion. It’s not often we seen such vulnerable loving speeches about people outside of tributes at funerals. We gotta change that. It’s unfortunate that such candid affirmation and gratitude is so deeply expressed. I’ve been inspired to be intentional about directly communicating my deep appreciation of others directly since that night. Including what the seniors said, there were 15 speeches that night. What was remarkable was how very little any of the speeches were about volleyball. The game itself faded into the background. Really, isn’t all organized sport about connection—enjoying the play of the game together? Learning how to be better as a whole than the sum of the parts? For me, these years were about fine young men becoming even better young men. And I am grateful. This week, one of the other moms spoke about how this team has been so good for her little one. Sometimes, we forget that underneath the expertise and the muscle and the strength of all athletes are tender hearts with spirits that can be bruised and strained. 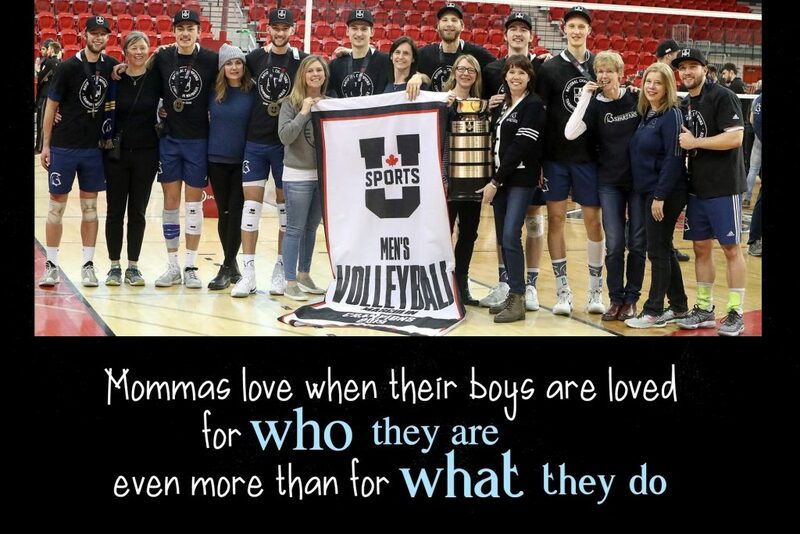 Us mommas remember them as little ones and are grateful when they are cared for, loved, and yes, pushed and driven to excellence by a coach that intuitively understands their underlying need to belong and feel welcome. The championship win was important for you and the whole team to eagerly and valiantly strive for. I get that. What was vital to me was that these years would be a time of growth and development for my son. I hoped he would be able to look back on with fantastic memories with his buddies playing a game that he loves. We live in a world where, too often, team sport is turned into a bitter contest. Athletes are shamed for making mistakes and coaches measure their self worth based on a win—so that loss becomes catastrophic. Athletes become burned out, bitter, and hardened. All too often, the game ceases to become fun. The game stops being fun. And then, maybe the game stops being a game at all. I am grateful that he leaves with good friends that will be lifelong, a continued love for the game, and a bigger heart than ever. 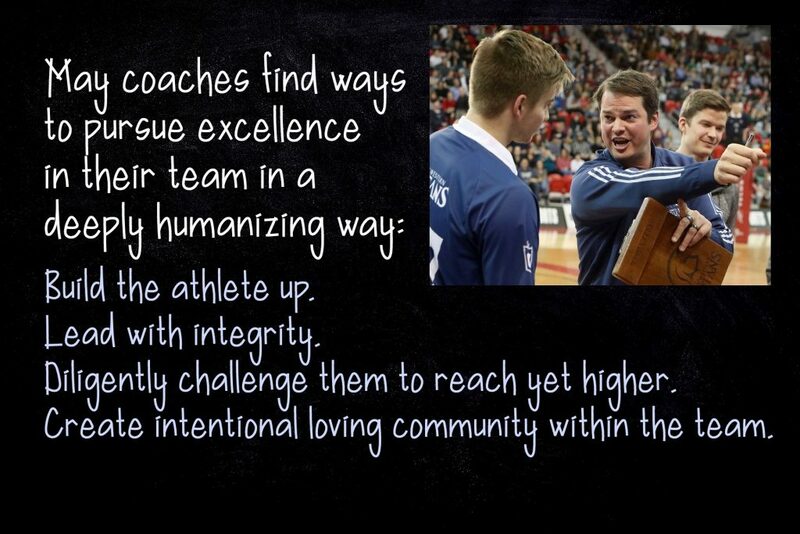 May more coaches find ways to pursue excellence in their team with a humanizing style that builds the athletes up, diligently challenges them to reach yet higher, leads with integrity, and creates intentional loving community within the team. I’m Ben’s Aunt who shamelessly attended every home game I was in town for – like a groupie! A 70-something groupie like I never was in my youth. It was an awesome year because I ended up extremely attached to each of the boys – a completely stellar bunch of athletes that shine as “cream of the crop” young men. I often made comments, congratulated and cajoled them after games and each and every one, each and every time, were ever so polite and expressed appreciation for their fans. Seriously – I’m now in volleyball withdrawal. Loved how you expressed what you saw in the TWU team and Ben’s leadership. Thank you. And – Carter and each team member were Ben’s favourites – mine too! I think I’m on the edge of “groupie” status myself…it’s gonna be a long wait until next season starts! I’m already looking forward to it! Thanx for commenting…And thanx for loving on the boys, including mine. Means a lot.